Natasha Khan's debut Fur And Gold was nominated for the 2007 Mercury Music Prize, and earned two Brit Award nominations for Best Breakthrough and Best Female in 2008. The album's blend of spooky childhood reveries and magical piano balladry caught the imagination of everyone and not just in the music world. Natasha was feted by the fashion crowd, appearing everywhere from Vogue to Dazed & Confused and she recently collaborated with Alexander McQueen's McQ label on several one-off pieces featured on the Two Suns artwork. As if that weren't enough, Bat For Lashes has inspired the making of a fantasy film-musical based on the songs from Fur And Gold . Natasha went on to be chosen by The Guardian as one of 2007's women of the year - the only musician to appear on their list that year. Bat for Lashes was also asked to support Radiohead on their European tour last summer at the band's personal request, where she assembled a new live band to explore fresh musical forms, before heading out to New York and the Californian desert to write what has now become Two Suns. A very ambitious record, both musically and conceptually, Two Suns delves into the philosophy of the self and duality. Metaphysical ideas about the connectedness of existence are also close to the album's heart. From the dustbowl psyche-rock of 'Travelling Woman' to the twisted Las Vegas wedding organ on the dark love song 'Good Love', Natasha has taken influence from disparate places. Written and recorded around the world, from the stark landscape of Big Sur and the Joshua Tree desert in California to the city sprawls of New York and London, it is kinetic and immediate, yet so intriguing sonically and lyrically that it demands time to be properly absorbed. Two Suns sees Natasha exploring her creative personas and the world around her in a very different way. Envisioning herself as two separate yet ultimately attached beings, we discover her inner character Pearl, the destructive blonde femme fatale that represents one extreme of her personality. Pearl's troubled obsession with childlike escapism and self-absorption opposes the wild and mystical desert being who represents Natasha's more spiritual self. Through the songs on the album, Natasha and Pearl take us on a journey as they intertwine and overflow into each other's realms, struggling to reconcile with each other, love and the forces of the outside world. Natasha is joined on several tracks by Brooklyn's finest psychedelic experimentalists Yeasayer, who provide bass and beat programming. The legendary Scott Walker also performs a duet with Natasha for the heart-wrenching torch song and album closer 'The Big Sleep'. As with Fur And Gold, Natasha chose to co-produce Two Suns with David Kosten (AKA Faultline). We begin with 'Glass', the opening track that encompasses the story behind Two Suns, a fable depicting two archetypal lovers coming together and pulling apart like two planets or two celestial bodies. 'Two' is a recurring theme throughout the album: two planets, two lovers, two extremes of a personality, two landscapes... This reflects in the sonic choices Natasha made on the album - combining opposing styles, the old and the new, the electronic and the organic. 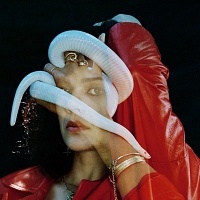 As 'Glass' unfolds and primal beats hammer away at Natasha's defiant vocal, we can hear Bat For Lashes' sound has evolved to create a lush and rhythmic new world. 'Sleep Alone' continues this theme, combining a nagging acoustic riff with dark disco beats and Natasha's spooked falsetto vocal, "My mama told me / the dream of love is a two-hearted dream". The album pace is brought down a notch with the sumptuous lovers' ballad 'Moon And Moon'. Debuted during the Fur And Gold tour, the track became a live favourite and was performed on the BBC Culture Show. Beautifully recorded, the simple, lush piano melody paired with Natasha's silky vocal yearning over long distance love and the pain of separation is a startling reminder of her effortless knack for straight-to-the-heart songwriting. 'Daniel', the first single to be taken from the album, is more light-hearted as Natasha sings of teenage love and nostalgia, as if she's writing the soundtrack of her 16 year old self. With layered vocals and twisted synths, it's an infectious retro-pop moment, powered by Yeasayer's Ira Wolf Tuton who can be heard playing the Fleetwood Mac-style bass lines. Starting life as a demo, 'Peace Of Mind' was secretly recorded while Natasha was messing around with guitars in the studio with Ben Christophers. An all-black, gay gospel choir from New York was added (looking like Prince backing-singers from the 80s and sounding like a ramshackle Persuasions) transforming the song into a bold and courageous choral chant, calling for peace of mind to all her beloved. 'Siren Song' continues to unveil the emotional extremes between Pearl and Natasha's rational self. It swings between the desire for a perfect, wholesome and innocent love and the destruction of that love through emotional sabotage. The chaos of this struggle is heard as the music switches from tender piano chords to a clamour of pulsing strings and flutes, ending with frantic drumming by Alex Thomas. The drums were recorded in two takes that were mashed together creating an array of beats and sonic breakdowns. The climactic 'Pearl's Dream' was inspired by Natasha's time spent living in Brooklyn on and off for the last two years. After programming a tougher city-beat, Natasha spent a day with Yeasayer in the Magic Shop studio in Manhattan, where Chris and Ira added Michael-Jackson-circa-Quincy-Jones era bass lines and off-kilter percussion. One of the most danceable tracks on the album, 'Pearl's Dream' has an incredibly addictive hook that shows how easily Natasha can turn her hand to pop's alluring fairy dust should the mood take her. Bat For Lashes' cult stardom is unquestioned - pop stardom, though, is tantalisingly within reach. The powerful, hypnotic and psychedelic 'Two Planets' is one of the more experimental tracks on the album. Cementing Bat For Lashes as a constantly evolving artist and pushing the boundaries of expectation, the track was borne of listening to a lot of early Herbie Hancock's synth experiments and Dead Can Dance. A cosmic call to arms that strongly conveys the vastness of the desert, the expanse of the sky and the struggle to experience connectedness, even in times of pain; "I am one of two planets dancing, I am the never ending life, and you are not separate from me, you are my mirror". Scott Walker joins Natasha for a duet on the final track, 'The Big Sleep'. It is the last we see of Pearl as the final curtain is called and she hangs up her dress forever. It describes the death of Pearl and symbolically, the death of the world of illusion. It's a darkly camp and theatrical performance to end the record. Having imagined Walker's voice on the track from the moment it was composed, Natasha sent it to him almost as a dare to herself. Spectacularly, he returned the favour and added an emotive vocal, perfectly ending this complex story. An album of epic geographical and artistic proportions, Two Suns confirms Bat For Lashes as the UK's most fascinating and progressive pop musician.